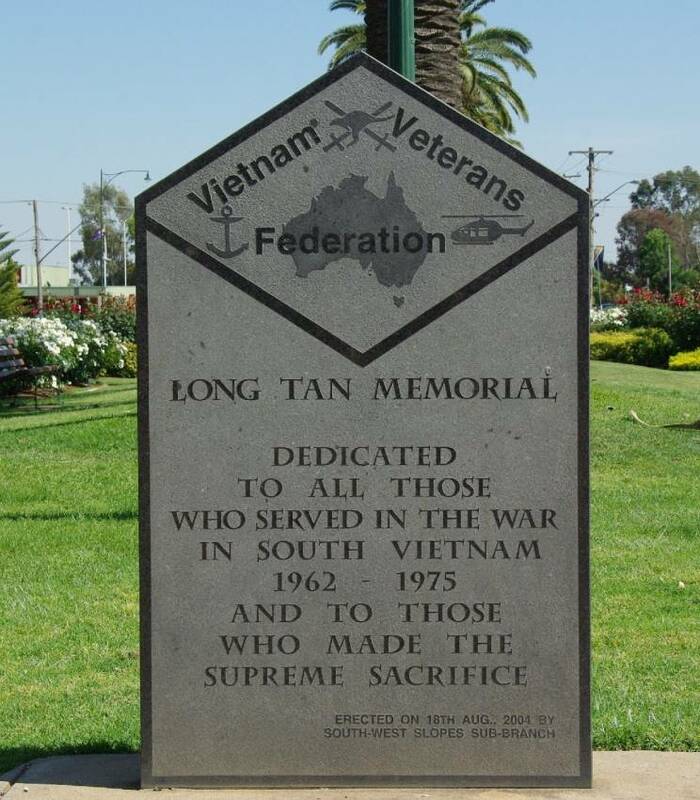 The Long Tan Memorial in Junee, NSW, Australia. 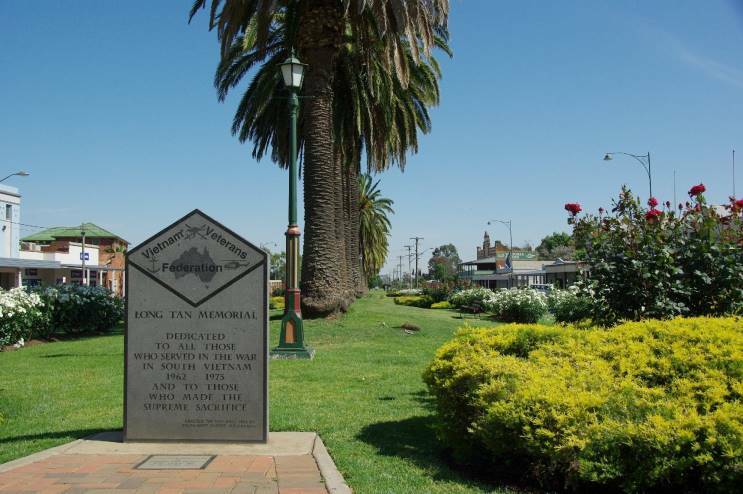 Located near the Junee War Memorial Clock the memorial is dedicated to Australia's Vietnam Veterans and those who lost their lives in the conflict. During the Vietnam conflict Australian forces were tasked with securing the Phuoc Tuy Province, some 65 km east of the South Vietnamese capitol of Saigon. The main base was established at Nui Dat, chosen to place the Australian task force centrally within Phuoc Tuy so as to separate the VC from the local population. The task force was supplied through the nearby Vung Tau port. New Zealand committed a field battery whose artillery worked with and in close support of the Australian units, the ANZAC force arriving at Vietnam during mid 1965. They soon developed the tactic of aggressive patrolling through the dense tropical jungle with the aim of keeping the enemy off balance and giving them no true safe haven in which to hide. Prior to the arrival of the ANZAC force, Phuoc Tuy was Vietcong territory controlled by 5 VC Division with 274 and 275 VC Regiments, D445 Provincial Division and local guerrilla units. During the early hours of 17 August 1966 the VC bombarded the Nui Dat base with 80mm mortar and recoilless rifle over nearly half an hour. Around first light B Company of the 6th Battalion, Royal Australian Regiment was sent to locate firing point and pursue any VC still present. As usual, the VC had vacated the area and, rather than return to base, B Coy was instructed to follow the VC trail. The following morning, 18 August, D Coy 6 RAR was sent to relieve B Coy who had still not located the VC. D Coy continued to follow the VC trail and by mid afternoon entered the Long Tan rubber plantation. First contact was made by 11 Platoon who initially pursued the VC but, surprised and coming under intense fire from three sides, were forced to adopt an all round defensive position. This VC assault coincided with the onset of a heavy monsoonal down poor that reduced visibility to just metres. It was soon apparent the Australians were heavily out numbered and out gunned - the platoon had encountered the entire 275 VC Regiment who were moving towards Nui Dat with the intention of inflicting crippling damage and casualties at the Australian base. 11 Platoon were clearly in serious trouble as 10 and 12 Platoons moved forward on opposing flanks to help with their withdrawal but they too were forced back by the overwhelming VC numbers and firepower that now included bombardment with 80mm mortars. Running critically short of ammunition, helicopters of the RAAF responded to the urgent calls by delivering ammunition drops, operating in the dark atrocious conditions through the driving monsoonal rains while under intense enemy ground fire. Artillery support from 1 Field Regiment was called in by the New Zealand Forward Observer accompanying 11 Platoon, directing well placed shells into and breaking up the VC concentrations. This intense bombardment and the continued monsoonal rains allowed for withdrawal of 11 Platoon while still under enemy fire. Fortuitously, they met up with 12 Platoon who was at that time also under pressure from the VC and at risk of being surrounded. Together these two units set a defensive perimeter while awaiting the next VC assault. APCs of 3 Troop, 3rd Cavalry Regiment (whose origins trace to the Australian Light Horse) had departed Nui Dat ferrying A Company 6 RAR to bolster the beleaguered troops of B Company who had by this stage suffered over one third casualties, including the fatally wounded platoon commander, and facing annihilation. Enroute to the Long Tan rubber plantation the APCs had encountered second VC regimental size force that was moving to encircle B Company in preparation for an all out assault. This was another fortuitous event as the APCs were able to engage, break up and scatter the VC formations prior to their assault. It was not until 1900hrs that 3 Troop finally reached Long Tan plantation and entered the fray, breaking up the VC as they were again massing for yet another assault. The 50 calibre machine guns of the cavalry unit brought much needed fire power and these took a heavy toll on the VC who quickly broke off their attack and withdrew into the jungle. This timely arrival of the APCs undoubtedly saved the remainder of B Company, turning what was developing into a heavy defeat into an astonishing victory. Although outnumbered almost 20 to 1, the Australians had lost 18 killed in action and a further 24 wounded, a significant number for such a small force. However, the scale of this engagement, later to become know as the Battle of Long Tan, only became evident the following morning with the recovery of large quantities of abandon weapons and nearly 250 enemy dead. Following Long Tan, never again did the VC mount a major offensive against the Australian forces based at Nui Dat. The Battle of Long Tan is now commemorated across Australia on 18 August each year in remembrance of those few who stood firm and held their ground against overwhelming odds and those who paid the supreme sacrifice. These are also remembered in many memorials to the Battle of Long Tan to be found in Australian cities and towns alike.